If you are in NYC and looking to do something low-key and FREE on a lazy Sunday, I have found the thing for you! 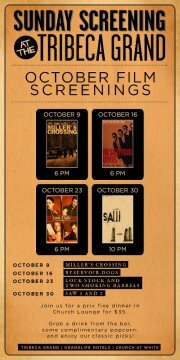 Stop by the Tribeca Grand Hotel for it's free October movie screenings at 6pm - this month's theme is gangster flicks. Like always, try to get there a few minutes early for the best seats and free popcorn. After the movie showings, Tribeca Grand screens the HBO hit "Boardwalk Empire" at 9pm for free. The hotel is located at 2 Avenue of the Americas in downtown Manhattan. Click here for directions. Very cool! Thanks for bringing this to our attention. I have to get better about scouting out free fun things to do around the city.